The week before the 2012 Transplant Games in Grand Rapids, we got the news that my son Darrius’ transplanted liver was failing. We were heartbroken, not just because we knew what this news meant for his physical health because he would have to endure another wait and, hopefully, another transplant. We also knew the emotional toll it would take on him, not being able to go and compete in the games. But, true to their name, the Team Texas Life Warriors took this news as inspiration to compete even harder – to honor Darrius who couldn’t be there. Most of the boys on the Team Texas basketball team were from Texas Children’s Hospital and knew Darrius well. The team wasn’t considered medal-contenders but brought their inspiration and grit to the Games and brought home a medal! And Darrius was also true to the name of Life Warrior, even if he hadn’t competed that year. He fought hard to stay as healthy as he could so when the call came for his second liver transplant, he was ready. And then, in 2014 and with his new liver, Darrius was able to rejoin Team Texas and compete in the 2014 Transplant Games in Houston. This time, he and the team claimed the GOLD in youth basketball. He says that his journey has been filled with many peaks and valleys, but the adversities we have faced as a family have shaped who we have become. Although it’s been difficult, he says he would not change anything as he sees his experience as God trusting him to remain faithful and to allow others to see His grace in action. Competing in the Transplant Games and being part of this Team Texas family means a great deal to Darrius and our family. Darrius is so excited to go to Cleveland and hopes to bring back gold again! We also see it as a way to give thanks to both donor families. 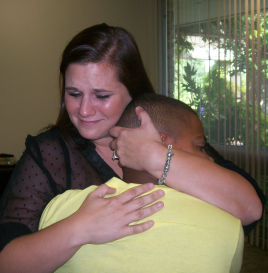 Darrius has met his first donor’s mother, Cassie – shown in the photo below. Her son, Cameron and their family have unselfishly given Darrius and our whole family the precious chance to live a happy and meaningful life. Cameron, we all thank you. These Games are for you.